Spring is just around the corner, and that means fun outdoor activities like the annual Egg Hunt in beautiful Wilder Park. This year’s event is on Saturday, April 20, from 9 a.m. to 12 p.m. Kids ages one through 10 years old are invited to meet the Easter Bunny and participate in the Egg Hunt, which starts at 10 a.m. sharp. Even family dogs get their own special canine egg hunt. All of us at Elmhurst Toyota enjoy the seasonal tradition of the Egg Hunt in Wilder Park and encourage you to attend. It’s free and fun for the whole family. Don’t forget to bring your Easter baskets for egg collection. Starting at 9 a.m., you can take photos with your kids and the Easter Bunny. Children who want to participate in the Egg Hunt are divided into groups by age, with each group getting their own designated egg hunting area. This year’s age groupings are from 1-2 years, 3-4 years, 5-7 years and 8-10 years old. 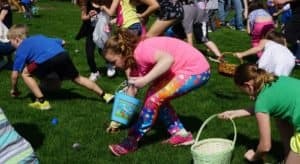 Each group has the opportunity to hunt for their share of the 10,000 eggs hidden throughout the park, including ones containing special prizes. Plan to arrive early enough for the Egg Hunt so you can locate the area for your kids to assemble with others in their their age group. The Doggie Eggstravaganza begins at 10:30 a.m. following the children’s Egg Hunt. Dogs get to sniff out their very own treat-filled eggs in the Eggstravaganza. Dress your dogs up for the chance to win prizes for best costumes! The fun-filled, action-packed 2019 Egg Hunt in Wilder Park is brought to you by the generosity of the following community sponsors: Suburban Bank & Trust, the Schiller Team and Healthy Driven Edward-Elmhurst Health. We hope to see you at the event! Saturday, April 20, from 9 a.m to 12 p.m.
Doggie Eggstravaganza begins at 10:30 a.m.
Visit www.epd.org or call 630-993-8900.